Beyoncé performs onstage during the 2018 Coachella Valley Music and Arts Festival at the Empire Polo Field on April 14, 2018, in Indio, Calif.
You see, this is why people stay claiming Beyoncé is Illuminati. 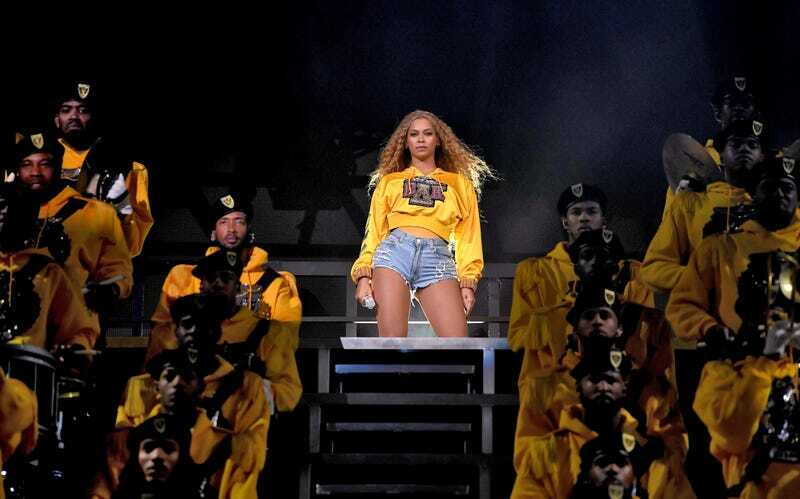 Nothing the Queen does ever seems to be without a deeper meaning, and apparently, her iconic Coachella #Beychella performance, which paid special homage to HBCUs, was no different. Monday, on the heels of that historic performance, Beyoncé revealed that through her #BeyGood initiative, four HBCUs—Xavier University of Louisiana, Wilberforce University, Tuskegee University and Bethune-Cookman University—will receive the newly established Homecoming Scholars Award Program for the 2018-2019 academic year. Indeed, the collegiate theme embraced throughout the superstar’s performance—complete with a marching band that literally could have been plucked from just about any HBCU, and her flaunting her college-style yellow sweatshirt with Greek symbols for “Beta Delta Kappa”—was not just for show, and she knows it. HBCUs are institutions of higher education in the United States that were established before the Civil Rights Act of 1964 with the intention of primarily serving the African-American community. Based, philanthropic queen of the double entendre, I simply have no words. I do have a question, though. When can I pledge Beta Delta Kappa?